The Eye Gym: A full Eye Exercise Package with everything you need: Instructions, routines, charts, + bonus computer animated eye workouts. The Eye Gym package is built on a range of eye exercises to improve vision clarity, eye control and overall give better eyesight. Based on the same principles as many of the best eye exercises and vision therapies available, it can offer a great way to deal with many vision problems. With the unique Eye Gym charts and workouts you can easily start rebuilding your vision*. These are based on effective principles, yet are simple and fun to use. There is a detailed and illustrated Workbook with unique Eye Exercise charts. The Workbook takes you through step by step how to help rebuild your vision. There are 4 computer animated eye workouts plus charts. These form a basis for eye drills or workouts which take your eyes through a full range of exercises. The charts can be used on your computer, or print them out and take them anywhere you are. Importantly, once you have learnt how to use the charts and workouts, you will use your eyes differently throughout the day, so the benefits are ongoing. The Eye Gym is not based on the Bates Method. All techniques in the Bates method are available free online, We suggest you access these and add them to the Eye Gym; particularly some of the relaxation techniques. Take a look at our Review of Eye Exercises page for more detail on effective ones. The animated workouts provide 1 and 2 minute Workouts at your computer with the click of a mouse. Your Eye Gym will come in a zip filed Folder which contains two folders. One folder will have your Eye Gym Workbook and chart files. The second folder will contain your four Eye Gym Animations and a User Manual file. The animations require QuickTime to run. QuickTime is installed in all Apple Computers and Windows software after XP. If you require QuickTime there is a download link below the “Buy Now” button. There is also a link to QuickTime installation instructions. There are two Divergence Workouts and two Convergence Workouts. Each convergence workout takes you through a 1 minute sprint of high impact eye exercise. 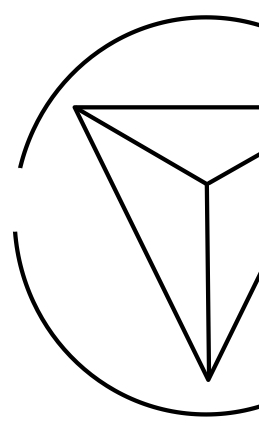 Each divergence workout will take you through two minutes. You will watch as images go 3 Dimensional and bounce around in their own little, 3D world. Follow dots and stars, and look for “hidden objects”. You will even follow a skating smiley as he “skates” down a “tube”! Designed to improve your eye coordination, focus and clarity of vision, these workouts make eye exercises fun at the click of a button. You will be amazed how quickly you will see the difference. We guarantee you will see the difference and have outstanding value for money. If not let us know.. If you are serious about doing something to improve your eyesight it is important that you know what your vision problems are. There are some issues which exercises will not deal with. If you are going to choose eye exercises to improve your eyes then it is important that they are the best you can get. If you want more information to help choose what you need check out our review of eye exercises page: Review on Eye Exercises page. If you want more information on what should be included in a quality eye exercise package you can also look at our Review on Eye Exercises page. 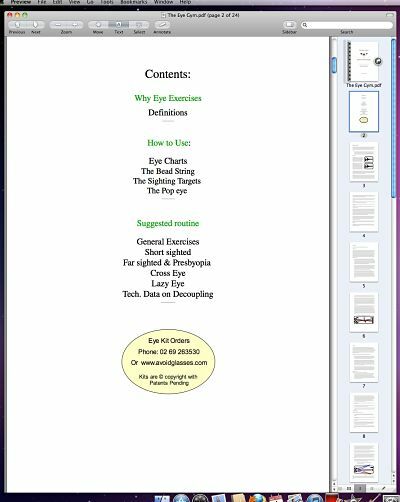 The Eye Gym is a package of Workbook, eye exercises, eye exercise charts, workouts and explanatory material with suggested eye exercise routines for you to follow. We are absolutely confident that if you follow the program you will see results very quickly. We now have many happy customers who have experienced the benefits of the Eye Gym. We have also tested just about every other “top”, “best selling”, “number one”, “bates method”, “secret key” and “world’s greatest” eye exercise program that we can find and we believe you will not find better effectiveness or value. To quote customers who have also tried others – we are superior! You can use the Eye Gym charts on your computer. You can print out the charts to take with you for convenience, or you can use the skills you will develop to do exercises absolutely anywhere you are, anytime. The collection of 12 exercise charts, plus other exercises, give your eyes a full workout. The image below left is a segment from an eye exercise chart. The workouts can make a difference to vision within days. These charts are designed to take your eyes through a range of activities which improve lens flexibility, and eye muscle control and coordination. Click images to enlarge. You also receive a full workbook This is a detailed guide on your eye exercise program and using the charts, the bead string and the Popeye. The work book has comprehensive, illustrated information on why your eyes do what they do, plus there are full instructions on how to make your own unique bead string if you wish, though its not necessary for every type of vision problem. This is not the single bead string commonly used in the past. The Popeye is also very simple to make with all the instructions. It will cost you just a few cents for materials, but is one of the most effective things you can do for your vision. + Learn where and why your vision is weak, blurry, or crossed. + Find out how your eyes are working together, and if they are not, discover where the problems are so you can deal with them. + Learn how to consciously control and improve your focus and the way your eyes work together. + Improve tone in the muscles that control your eyes. + Sharpen your focus and improve lens flexibility and vision. + Product support and email or phone support (depending on country). Oh yesterday, before I left to go out, I had the weirdest feeling: after working out my eyes I drove around in my car and noticed the 3d effect and it was just mind blowing. It felt like things were sticking out at me. I was staring at the trees and houses and thinking to myself how beautiful seeing really is. Thank you. I now know surgery isn't for me - convergence/divergence and eye suppression exercises are. I'll now stand by!" 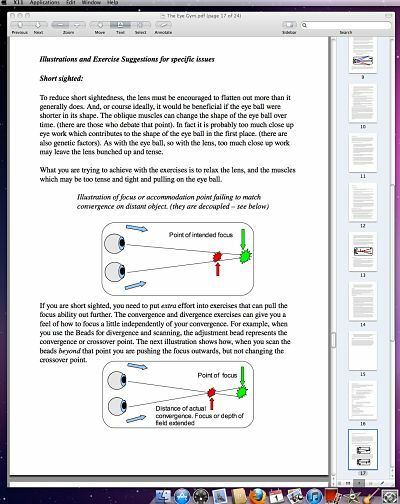 Below is a screen shot of page 17 of the Eye Gym Work Book showing a snapshot of some information about short sightedness and a part of the information of how our bead string relates to the issue. 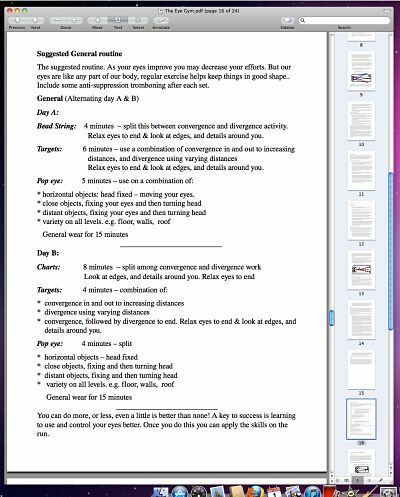 The final screen shot below is from page 16 of The Eye Gym Work Book showing suggested Eye Exercise routines. We recommend anywhere from 5 to 20 minutes a day with an easy to follow program. Once you learn the skills, it becomes easier every day, and you will know how to use your eyes more effectively in everything you do. Once you learn the skills and improve your eyesight, you should find you can go longer periods of time without doing the workouts, so you don’t need to be stuck doing it every day and forever! Do the exercises and you will* see more clearly and sharply because you are dealing with the causes of bad eyesight. It’s as simple as that. Clicking on the buy link above, or below, will take you directly to PayPal. After you have placed your order you will be emailed a personal link to download your Eye Gym. The link will remain valid for one week after your purchase. You can use either your PayPal account or a Credit card. *The Eye Gym is designed to help with vision issues related to lens flexibility, (ciliary), and eye muscle (extra ocular) strength and coordination. This includes things like blurry vision, lazy eye, cross eye, and short and far sighted. The Eye Gym is not recommended for things like Macular Degeneration and vision problems which may require surgery etc. If you are not sure whether or not you may be suffering from such conditions, we encourage you to seek appropriate professional/medical advice. Copyright: Chris Barrett B.A., Th.